Geordan Murphy has revealed that his rivalry with Leicester Tigers team-mate and business partner Martin Castrogiovanni is heating up ahead of their two nations' pivotal Rugby World Cup Pool C meeting in Dunedin. Murphy's Ireland go into the game knowing that just a draw is enough to guarantee them top spot and a likely quarter-final clash with Wales. 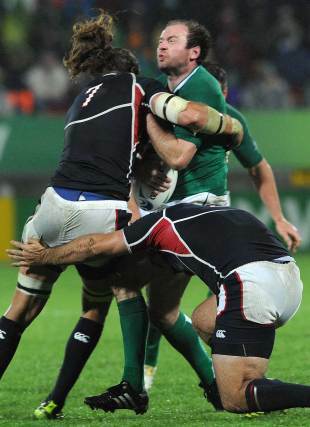 However, Castrogiovanni's Italy will definitely qualify if they defeat the Irish by more than seven points. Given that the game is so beautifully poised and that there is so much at stake for both sides, it is hardly surprising, then, that Murphy and Castrogiovanni, who co-own a restaurant, are currently doing their utmost to get under one another's skin. "If you look at the shape of both of us, I tend to drink a lot of water and he tends to eat a lot of the food," Murphy said of their common business interest. "He's been texting me. The closer the game gets, I'm receiving more and more text messages from him. He swears a lot at me in Italian and he's trying to teach me all the bad words. I'm not going to repeat them." Castrogiovanni is renowned for his scrummaging and Italy are expected to severely test the solidity of the Irish set-piece. However, Murphy has a novel plan to counter the threat poised by his club-mate. "I'm big into my scrummaging, so I'll definitely be telling my forwards about how to scrummage him," he said. "I'm thinking of leaving some baskets of chips in the corners of the changing room for him. That should do it. The amount he eats, it should distract him quite nicely." Ireland have a fine record against the Italians, having never lost to the Azzurri in Six Nations competition. However, Declan Kidney's side needed a late drop goal from Ronan O'Gara to sneak past Italy earlier this year and Murphy is expecting another tight contest on Sunday. "It's the biggest game of the pool," he said. "After they lost to Australia, Italy said they're targeting this game. They've openly said they want to reach the quarter-finals, which basically means they're saying they want to beat Ireland. "They've improved massively over the years. They're a serious side. They're a very physical side but they're playing some good football alongside that now. "Some of the tries they're scoring at the World Cup have been good tries. Our backs will be against the wall as much as theirs will. "It's Italy, but they'll raise their intensity from the Six Nations. It's the World Cup, it's a level up from the Six Nations and I'm sure the game will reflect that."